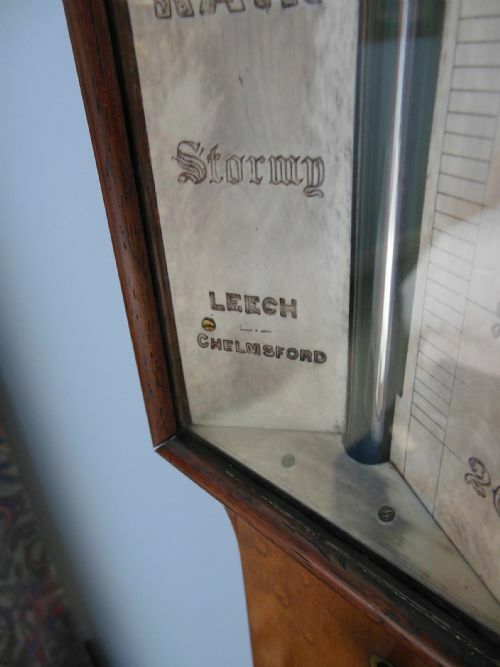 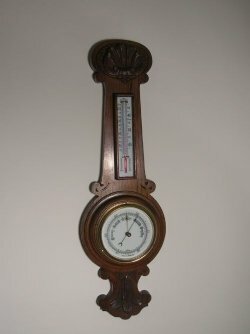 Made by "Leech of Chelmsford", an ivory adjustment knob controlling the internal Vernier scale, and with the weather predictions engraved on an ivory panel, beaded around the barometer and thermometer in rosewood this is a superb quality instrument that looks fabulous on the wall. 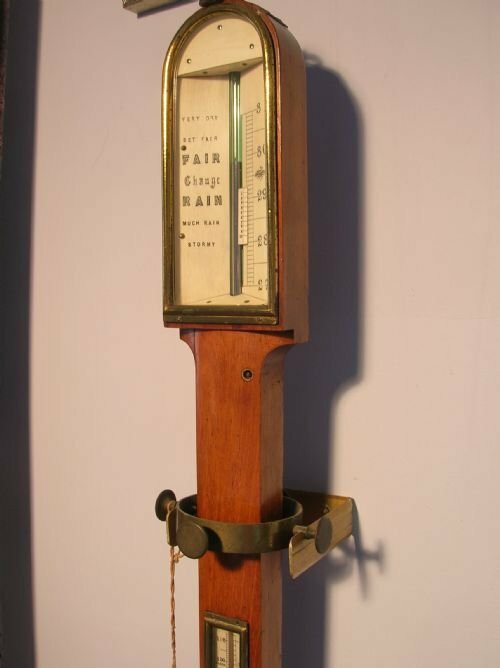 It is full working order and correctly calibrated. 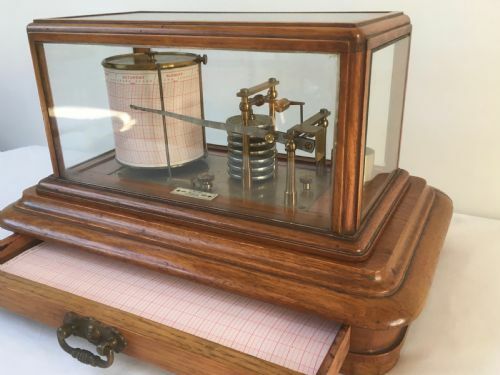 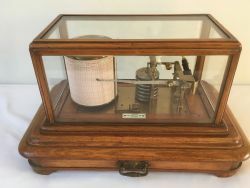 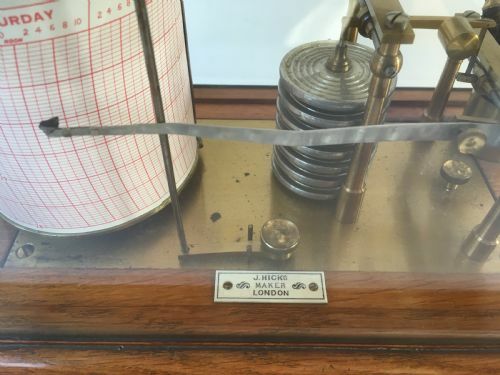 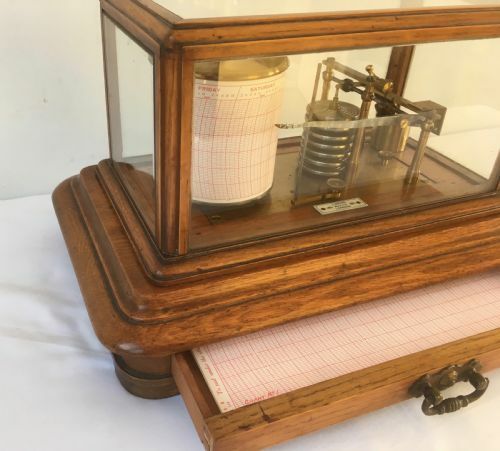 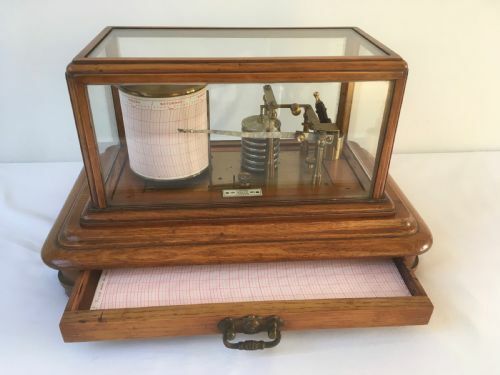 Very original and in excellent working condition this 8 day, 7 chamber vacuum, Oak cased barograph has the original glass ink server was made by the reputable firm J Hicks of Hatton Garden, London towards the end of the 19th Century. 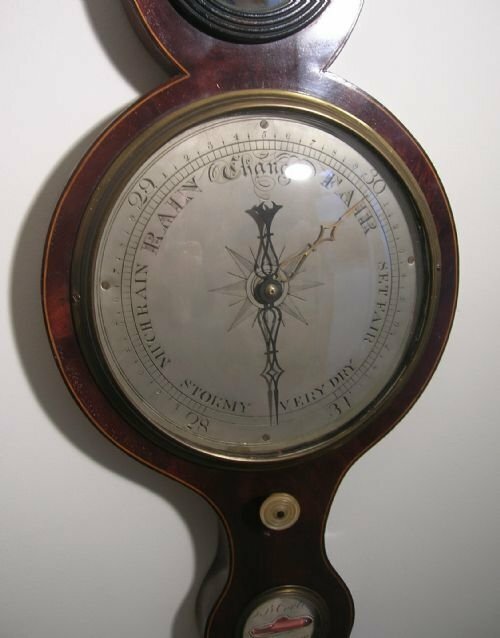 The company was active 1861-1911 and was considered one of the best makers. 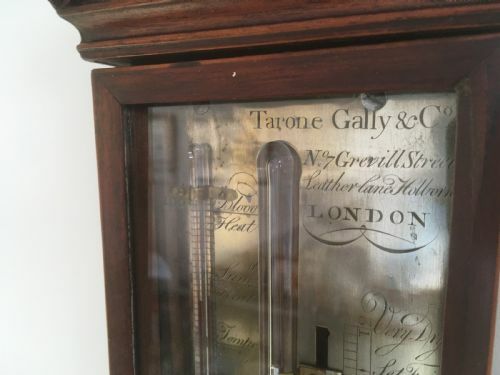 Georgian Mahogany Stick Barometer by Tarone Gally & Co.
Made by Tarone Gally & Co of No7 Grevill Street, Leather Lane, Holborn, London in the early 19th century this mahogany cased stick barometer has just been restored with a new glass column, new mercury and recalibrated. 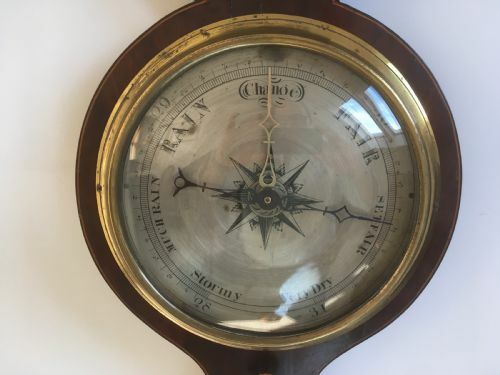 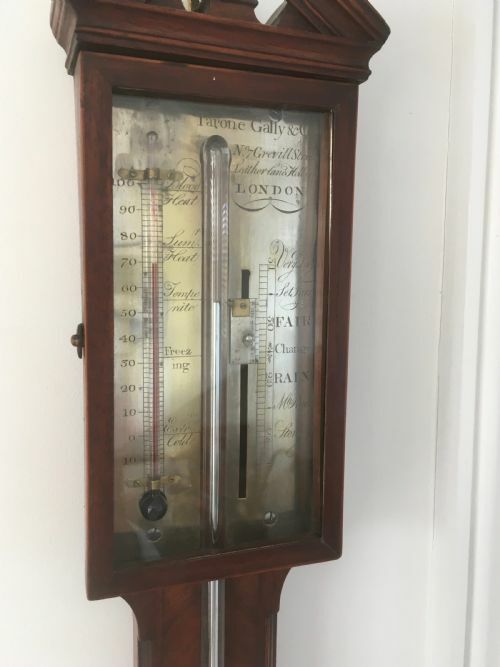 It is in exceptional condition with a polished metal face showing in inches the prevailing weather conditions, a thermometer with an opening glass door to move the vernier. 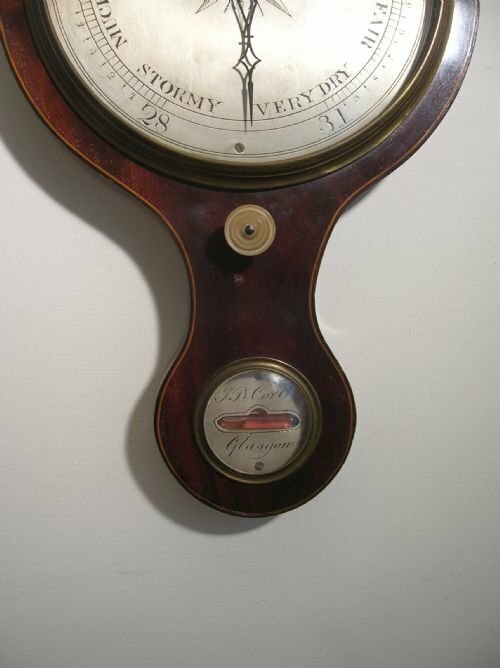 Dating from the mid 19th century this mahogany wheel barometer has just been sympathetically restored so retains its original patina with new internal glass column, mercury, strings and weights. 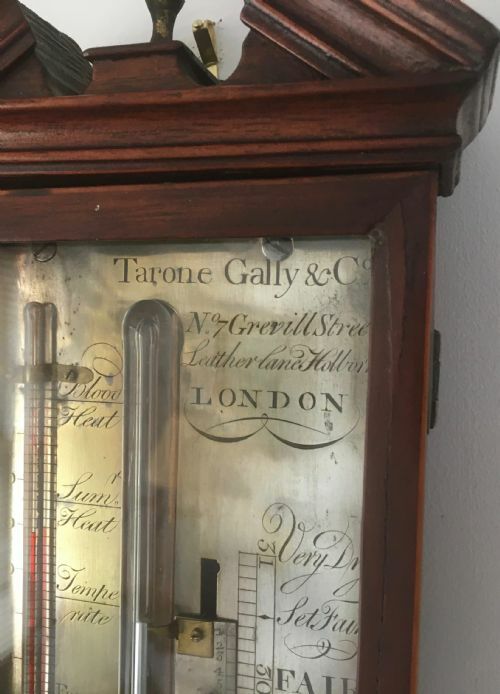 The traditional 5 glass set up with hydrometer, thermometer, mirror, barometer and level is marked J C Moretti of Lynn (King's Lynn in Norfolk). 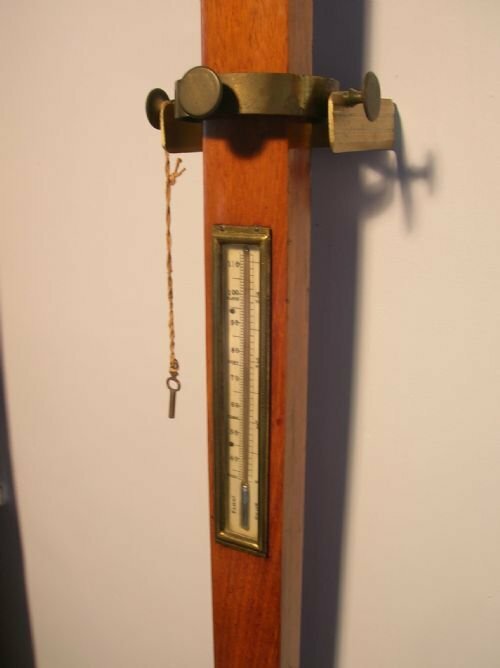 Rare early 19th Century maritime barometer mounted on a wall bracket with a brass gimbal arrangement to allow for the movement of the sea. 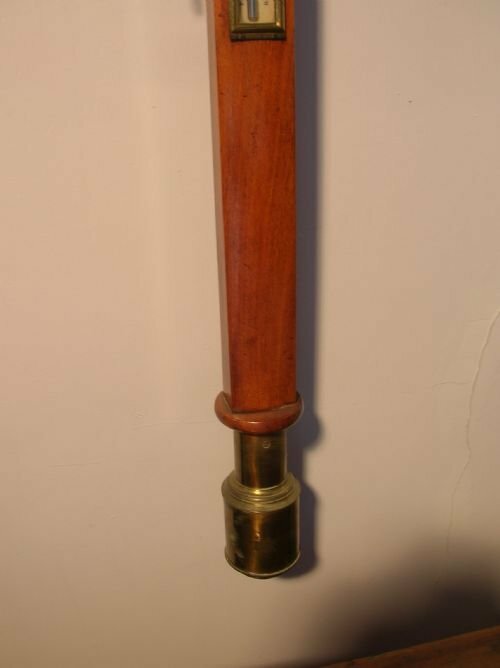 It also has a ring on the top to enable it to be suspended from a ceiling or bulkhead. 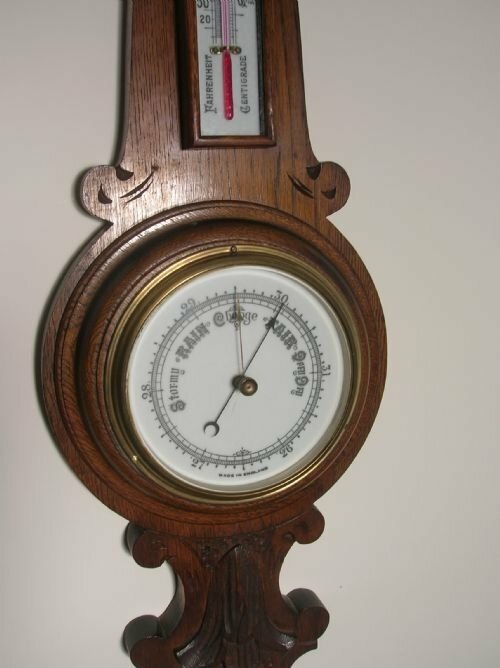 The top section is the barometer with a thermometer in the centre, there is also a key for adjustment. 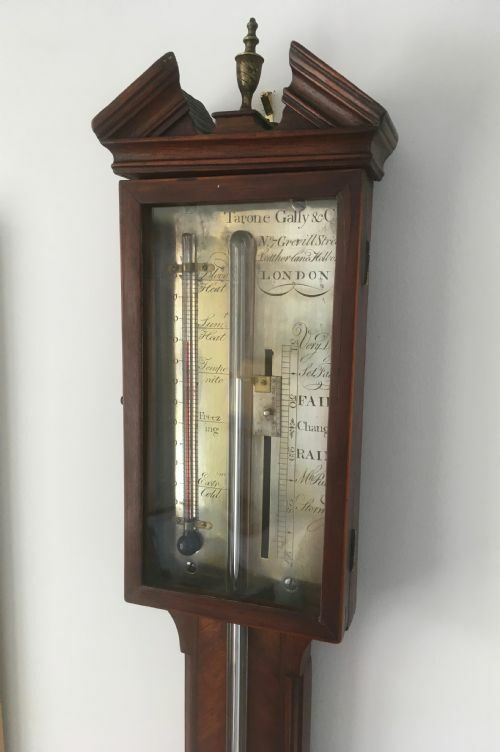 Unknown maker but of obvious quality, this barometer will be serviced and recalibrated prior to delivery. 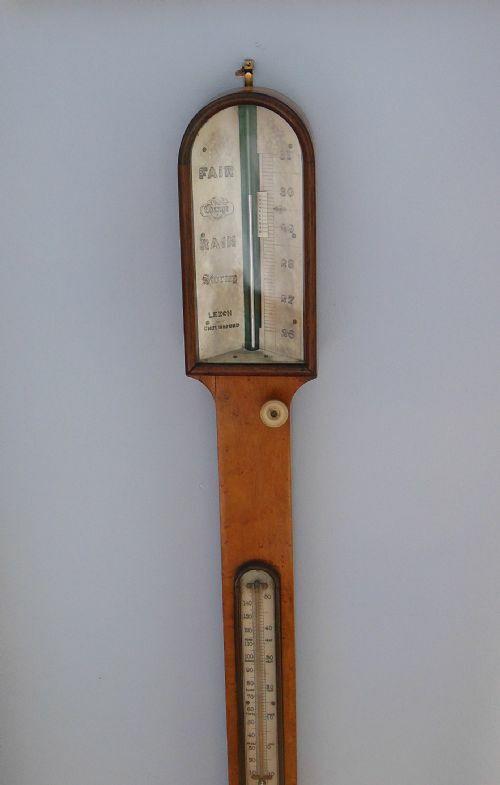 Mid 19th century 5 dial banjo barometer. 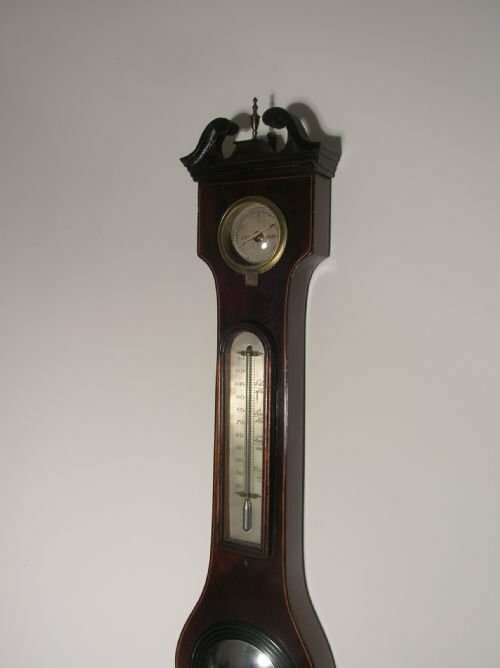 Mahogany case with a swan neck pediment and brass finial inset with 5 silvered dials, hygrometer, thermometer, convex mirror, wheel mercury barometer and level. 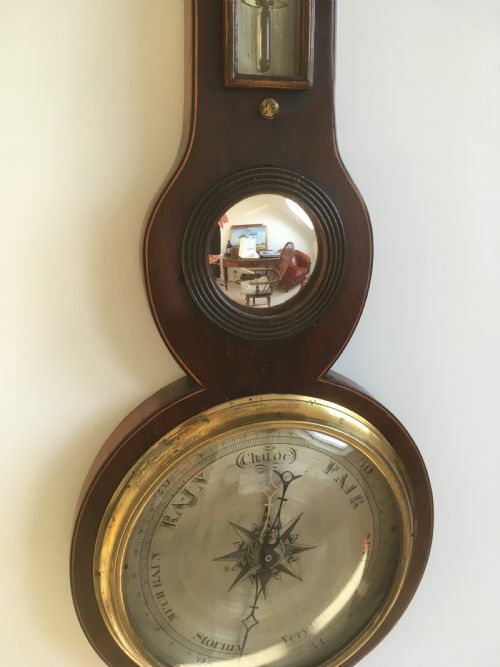 The main dial is 8" (20cms) and the case length is 39" (100cms). 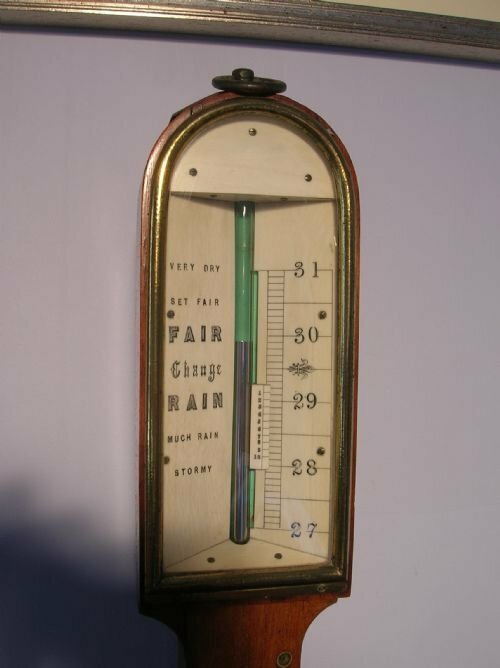 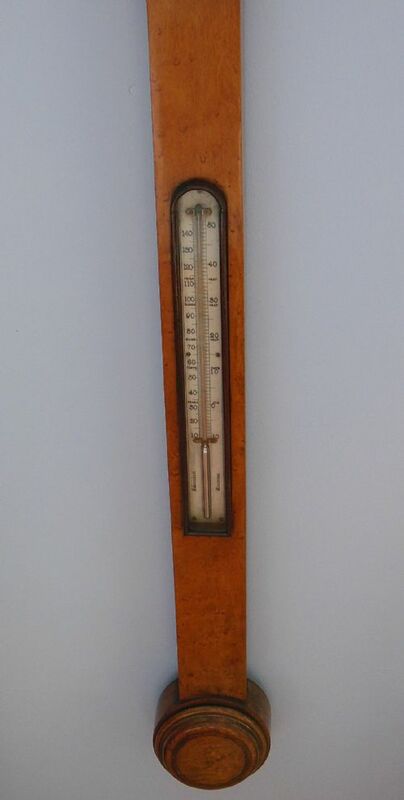 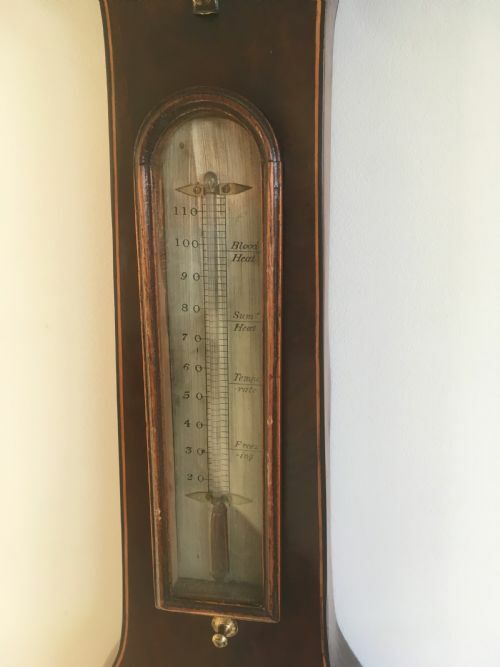 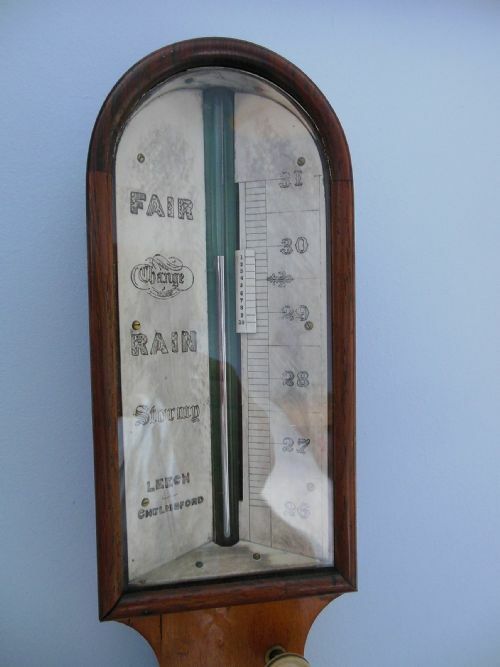 Early 20th Century Edwardian Oak wheel barometer and thermometer. 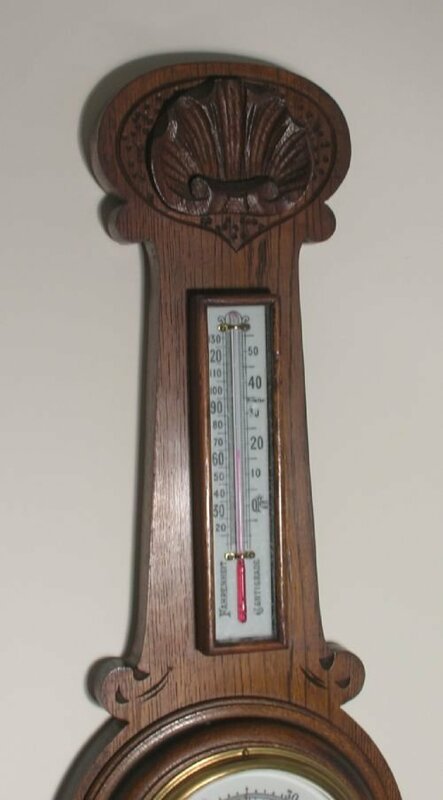 Crude shell carving at the top and an upturned Fleur de lys at the bottom.